Hello friends! I am always fascinated by how my friend May Park creates beautiful one layer stamped cards, I really love her projects so I decided to try and stamp a one layer pattern myself. I have to say – its not that easy lol! But the result is definitely worth it and nothing beats a true one layer project. I used my mini MISTI for perfect stamped images – I had to double and triple stamp some of these for ideal results. 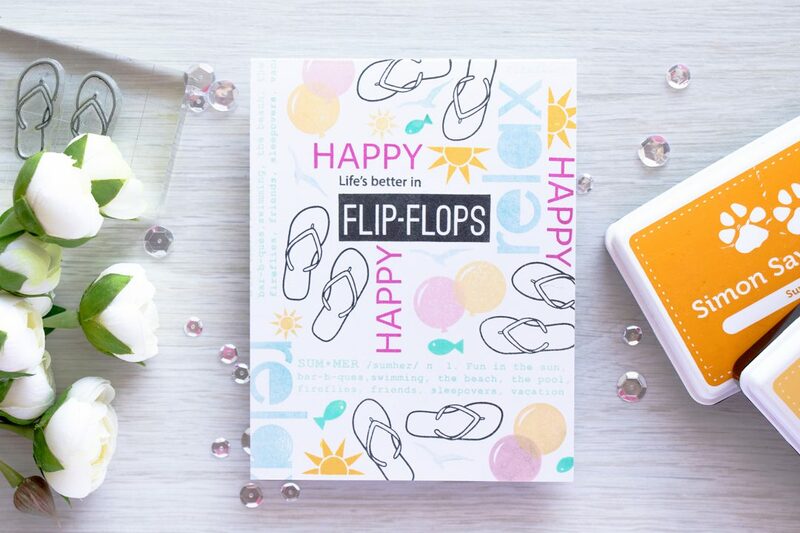 I started by first stamping “Life is better in flip flops” using Simon’s Intense Black ink. 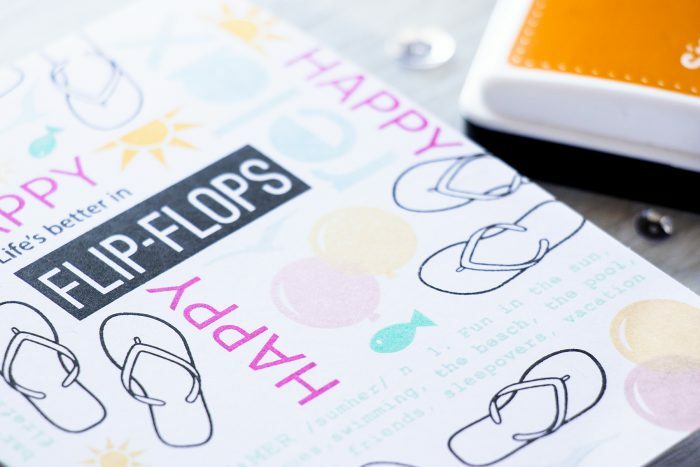 I stamped flip flop images using the same black as I was first planning to color them with alcohol markers. 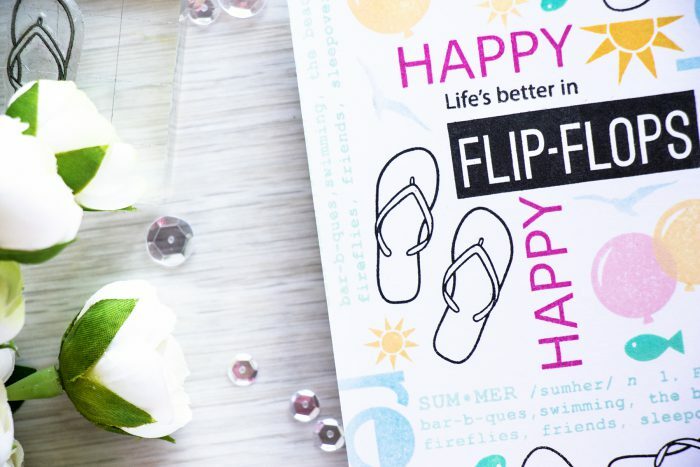 Another reason I went with black is because I wanted the sentiment and the flip flops stand out from the background and really showcase the message on this card. I used a lot of images from various sets from Simon to complete the pattern. Sentiment came from the Happy Block Greetings set, flip flops are from Flip Flop Season set, balloon is from the Big Birthday Wishes, “Happy” and summer definition are from Pool Play and finally “Relax” is from My Sunshine. I also used a few sea gulls from the Cloudy Sky. As for the colors, I went with Duckling and Sunshine, Twirling Tutu and Doll Pink, Surf Blue and Mint Candy. I really enjoyed stamping this pattern and I can see stamping designs like this in the future, it is a bit time consuming, but definitely fun and relaxing. This is so cute! 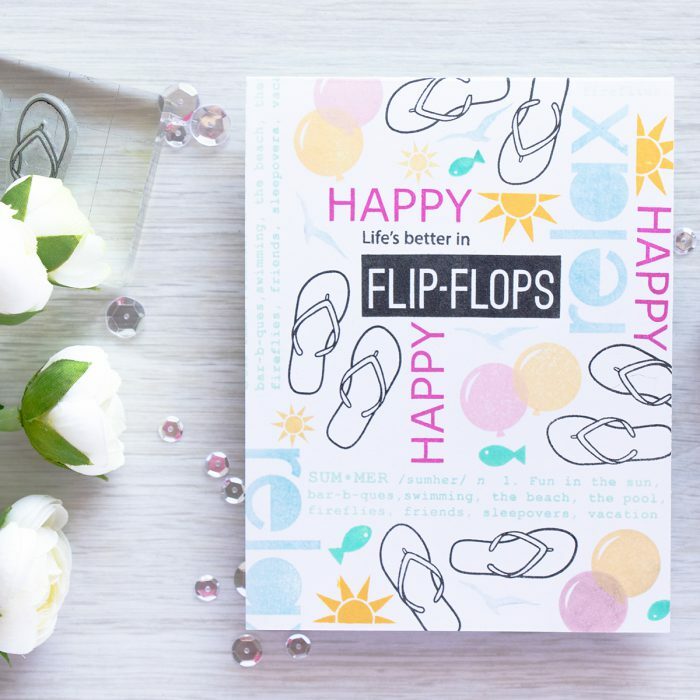 Love the sentiment – so true of me – I’m always in flip flops.